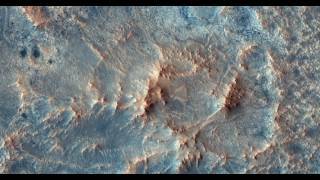 Stunning Ultra HD 4k images of the surface of Mars. The MRO is a multipurpose spacecraft designed to conduct reconnaissance and exploration of Mars from orbit. Maven, currently in Mars orbit, was built to examine the atmosphere of Mars in order to help scientists understand the planet's relatively unknown history. William Shatner narrates about NASA's Curiosity rover, from its entry and descent through the Martian atmosphere to its landing and exploration of the Red Planet. 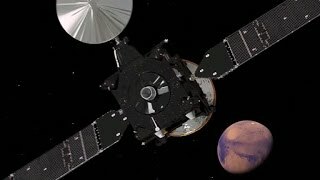 ExoMars is several missions in one. Its orbiter is a science and relay mission. The TGO will search for evidence of gases, such as methane, that may be associated with geological or biological processes. NASA Confirms Methane on Mars - But Does That Mean Life? You can buy Universe Sandbox 2 game here: http://amzn.to/2yJqwU6 Hello and welcome! 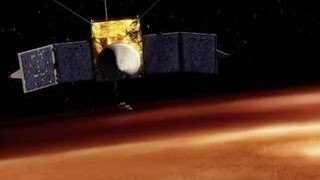 My name is Anton and in this video, we will talk about the confirmation of methane detection on Mars, but what does it mean? The paper is here: https://www.nature.com/articles/s41561-019-0331-9 And another interesting study is here: https://www.nature.com/articles/s41598-018-27082-0 Support this channel on Patreon to help me make this a full time job: https://www.patreon.com/whatdamath Space Engine is available for free here: http://spaceengine.org Enjoy and please subscribe. Twitter: https://twitter.com/WhatDaMath Facebook: https://www.facebook.com/whatdamath Twitch: http://www.twitch.tv/whatdamath Bitcoins to spare? Donate them here to help this channel grow! 1GFiTKxWyEjAjZv4vsNtWTUmL53HgXBuvu The hardware used to record these videos: CPU: https://amzn.to/2LZFQCJ Video Card: https://amzn.to/2M1W26C Motherboard: https://amzn.to/2JYGiQQ RAM: https://amzn.to/2Mwy2t4 PSU: https://amzn.to/2LZcrIH Case: https://amzn.to/2MwJZz4 Microphone: https://amzn.to/2t5jTv0 Mixer: https://amzn.to/2JOL0oF Recording and Editing: https://amzn.to/2LX6uvU Thank you to all Patreon supporters of this channel Specifically, great thanks to the following members: Thank you to all Patreon supporters of this channel Specifically, great thanks to the following members: Mark Teranishi Mayumi Marin Templeton Sam Reed Lilith Dawn Lars Bo Rasmussen William Nick Dolgy Greg Lambros Luminger UnexpectedBooks.com Daniel Rosvall Lauren Smith Michael Tiganila Jordan Jer Lyndon Riley Michael Mitsuda Dave Blair Bartholomew Macaluso Konrad Kummli Alexander Leimbeck Kai Raphahn Sander Stols Sergio Ruelas George Williams Justin Fortune Shinne Gordon Cooper Tracy Burgess Jakub Glos Johann Goergen Olegas Budnik Richard Colombo Sonja Prazic AA Jayjay Volz Chase Staggs Albert B. Cannon Jake Salo LS Greger Marcel Levi Anataine Deva Becky Robert MacDonald gary steelman Liam Moss Michael Koebel Shelley Passage Steven Aiello Tom Warren xyndicate Zachary Fluke Bob Davies Steven Honey Suzanne Lyons Patrick Ray Vinod sethi Bodo GraÃŸmann James Myers Michael Rucker Niji Ralph Spataro Robert Wyssbrod Daniel Coleman Matthew Lazear Rock Howard Steve Wotton Arikkat Unnikrishnan Aneliya Pancheva Vincent L. Cleaver Angelina Werner Claye Griffith George Naumov Howard Zhang Kyle eagle Stan Komander Tarik Qassem Andrey Vesnin MrR Anton Newman Charles Nadeau Dave A Doug Baker George Lincoln Rockwell GrittyFlix Minovsky Man Paul Koploy Peter Hamrak Sal Carrera TBPony Willem ter Harmsel Doug MacDonald Jacob Spencer Jakub Rychecky Shaun Cahill Chris Miller David Lewis Eric White Greyson Flippo Hampton Tunis Ivan Gallagher Janne Vuorenpää JohnTaylorWalker Jon Haynes Lynn Johnson Michael J Fluharty Mr. M-Bag Nathan Egan Rob Law Scary ASMR Thierry Ray Jehlen Gasnier M Velt Silvan Wespi Thomas Erskine Kendall Wake William Warren Arsenii Pilguk Daniel Tyson Dylan Do Erik Storesund Ged Warren Hernán Coronel Joachim W. Walewski Jonas Reinitz MiekWave Robert Nenciu Stephanie McAlea Tedd Speck Will Hardy Adrian Boyko Alex Boone Torben Cro-Magnon Gramps David Heimbold Declan Dhiraj Sapkal Exo Sol Francis Lennon J Youles Jelle Maximilian Jänicke Orac Paul dunn RAJARSHI SHUKLA Sun Sun surfingdiamond Uwe Böhnke Russell Sears Anton Reed Mifxal Mr Fluffington Jordaen Troy Schmidt Matthias Fiebig Check the Patreon page to join. An exploding asteroid slammed into Mars’ surface within the past ten years, say scientists based on photographic evidence. You can buy Universe Sandbox 2 game here: http://amzn.to/2yJqwU6 Hello and welcome! My name is Anton and in this video, we will talk about the end of the NASA Opportunity mission and the interesting facts that most people may have not known about. Opportunity landing video is here: https://mars.nasa.gov/resources/20172/mars-exploration-rover-entry-descent-and-landing-on-mars/ Support this channel on Patreon to help me make this a full time job: https://www.patreon.com/whatdamath Space Engine is available for free here: http://spaceengine.org Enjoy and please subscribe. Twitter: https://twitter.com/WhatDaMath Facebook: https://www.facebook.com/whatdamath Twitch: http://www.twitch.tv/whatdamath Bitcoins to spare? Donate them here to help this channel grow! 1GFiTKxWyEjAjZv4vsNtWTUmL53HgXBuvu The hardware used to record these videos: CPU: https://amzn.to/2LZFQCJ Video Card: https://amzn.to/2M1W26C Motherboard: https://amzn.to/2JYGiQQ RAM: https://amzn.to/2Mwy2t4 PSU: https://amzn.to/2LZcrIH Case: https://amzn.to/2MwJZz4 Microphone: https://amzn.to/2t5jTv0 Mixer: https://amzn.to/2JOL0oF Recording and Editing: https://amzn.to/2LX6uvU Thank you to all Patreon supporters of this channel Specifically, great thanks to the following members: Mayumi Mark Teranishi Lilith Dawn Marin Templeton Sam Reed William Nick Dolgy Luminger Greg Lambros Unexpectedbooks.com Lauren Smith Michael Tiganila Jordan Michael Mitsuda Lyndon Riley Jer Dave Blair Leo Wehrli Konrad Kummli Alexander Leimbeck Sander Stols Kai Raphahn Sergio Ruelas Olegas Budnik Tracy Burgess Bartholomew Macaluso Gordon Cooper George Williams Jayjay Volz Shinne AA Justin Fortune Chase Staggs Jakub Glos Toğrul Hüseynli Moonic Robert MacDonald Becky Giovanni Perryman Steven Zachary Fluke Anataine Deva Bob Davies Steve Aiello Michael Rucker Tom Warren Xyndicate Bodo Graßmann Liam Moss Michael Koebel Gary Steelman Jake Salo Shelley Passage Honey Suzanne Lyons Arikkat A Unnikrishnan Angelina Werner Steve Wotton Rock Howard Daniel Coleman Aneliya Pancheva Niji Ralph Spataro Peter Hamrak Andrey Vesnin Willem ter Harmsel Robert Wyssbrod James Myers MrR Vincent L Cleaver Jacob Spencer Stan Komander Claye Griffith Jakub Rychecky JohnTaylorWalker Jon Haynes Shaun Cahill George Naumov Kyle eagle David Lewis Matthew Lazear Michael J Fluharty Howard Zhang Former Patrons: Tim Sageser Jokage Jurrien Diepenbroek Lunos Hundolin Galaxia Zio Nelson Reyes Brett Comeau Jamie Walcott Hazen Miller Bobby Kent Snowie15 Madalevek Khai Hung Joseph McEvoy Isambard Jason Neuschmid Nicolas Belanger Peter Rose Nor Dine Galant Human Jeffrey Paik Check the Patreon page to join. NASA has offically declared Mars Opportunity dead after trying to wake it for the last few months. The Rover exceeded its design in every way and set records for the distance it covered on another planet. A NASA orbiter captured a recent impact on Mars. Aspiring Martian Colonist and Astrophysics PhD candidate Ryan MacDonald dives into SpaceX's achievements in 2018, gives an update on Starship/BFR development, discusses the #dearMoon project, and presents an early highlight from NASA's InSight Mars lander. -----Further information and links----- Will be added in the next day or two! If life exists on Mars, it still hasn’t showed itself, but recent evidence from the red planet increasingly supports the possibility. Life could have developed there. Most of the conditions are right and nothing found so far rules out the possibility, either in the distant past or today. If something is or was alive there, it’s probably tiny. Since microbes make up the vast majority of life on Earth, microbes are the most likely thing to find somewhere else. It’s not so easy figuring out what “alive” means on another planet—let alone finding a living microbe. The upcoming Mars 2020 mission and its rover-based mobile laboratory will take another giant step toward answering the question. First, though, science needs to answer some questions about life here on Earth. It turns out that the dark, hard manganese oxide in varnish coating cliff faces and rocks throughout the American Southwest and elsewhere has a lot to say about the subject.